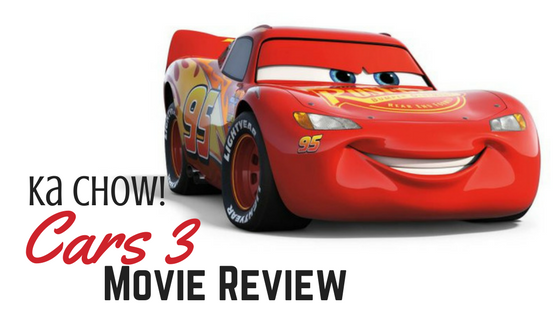 Cars 3 Movie Review: Ka Chow!! Like many little boys, my son has been counting down to see this movie for many months. Tuesday night we finally reached the finish line and got to go screen Cars 3. We walked in the theater, 3D glasses hand, and a big ol’ bag of popcorn in the other. I was leery of how this would play out. We have love Cars since the beginning when our son saw the very first movie on DVD. He had just turned 2. When McQueen first raced into our lives none of us dreamed he would totally enchant our son the way only he could. Our little guy’s first bike had McQueen on it, so did his bed, his bedding, and his first kite. When he wasn’t watching Cars he dragged his scratched DVD around the house like a cherished possession. Countless hours were spent racing those cars over ever square inch of our home and McQueen raced his way into our hearts. When the first teaser trailer came out for Cars 3 the 49-second clip was awful, just awful! Honestly, if I had of watched it by myself I don’t know if I would have shown it to my kids but there we were, as a family watching the trailer on the big tv in the living room. The foreboding sound of a slow heartbeat thumps while cars zip past on a track at lightning speed. McQueen races past, but his wheels are spinning out and he looks like he’s about to crash. The announcer shouts “McQueen is fading! Fading fast!” before the screen suddenly goes black. Then all you hear is McQueen’s labored breathing as he soars through the sky — fiery debris flying everywhere —toppling end over end across the race track, battered and broken smashing into the ground. You could hear a pin drop in our living room. Here, see for yourself! I can wait…. Awful right?!?! For months I kept telling myself that McQueen wasn’t dead. We have been anticipating a quality sequel for 11 years and I don’t think this disappoints. It’s everything Cars 2 should have been, even bringing in flashbacks and a storyline featuring Doc Hudson which absolutely tugged at my heartstrings and had my eyes a bit misty. We got answers to questions about Doc’s past and pieces to a puzzle McQueen needed to move on. All our favorite characters make a re-appearance and get a moment to shine, from Mack, and Ramone and Lizzie down to the tractors. Mater fans may be disappointed that he doesn’t have as big a part as he did in the first two films but I think this movie will pleasantly surprise you. Especially since Cars 2… No, just no. But if you aren’t a Cars fan and never have been, I’m not sure this movie will blow you away. This third installment in the Cars franchise takes us back to the deeper relationship we hoped for with “Lightning and Friends,” and we enjoy a passing-of-the-torch adventure loaded with great messages of honor. And power slides. In this story, Lightning isn’t ready to take the merchandising money and run (which is sort of funny since my son still has oodles of car No. 95s in every nook and cranny in his bedroom plus a handful in toy chest). Lightning battles a fascination with the new shiny things but keeps his focus well-grounded in his core truth—he loves the sport and he loves the friends who stand by him. Pixar created a wonderful experience for families to feel happy (and resolved) for their friend Lightning McQueen. I liked the strong story of honor for the past and the people who paved our paths; the importance of realizing how they dedicated their hearts and talents to our success. As a mom I saw myself a lot in the character Smokey when he showing McQueen his collection of letters from Doc, detailing McQueen’s success. And another delightful part of the Pixar gift was the animated short film preceding the movie. “Lou” will prime your pump for a sweet and uplifting whole-movie experience. It really is a beautiful story with a great moral for every kid about kindness. Lighting McQueen goes on a quest to get his speed back but has to face the facts that he’ll never be as fast as the newer generation of race cars. He has one last chance to win again – can he do it?! 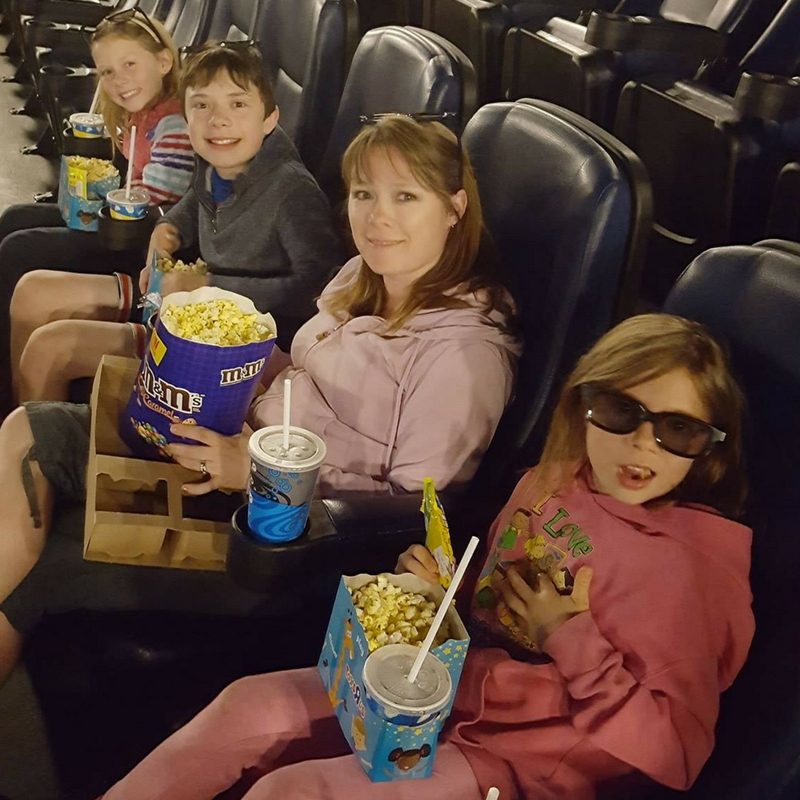 Cars 3 is a fun adventure that our family didn’t want to end. We were the last ones out of the theater and I can’t wait to see it again! « Cool Summer treats: 3 recipes to make your next party a sweet- and special- one. We can’t wait to see this! It definitely sounds like a fun family night out! We’ve been Cars fans from the first movie. Our family just loved Cars 3. Such a fun movie! Is it terrible that I am looking at your pictures and I just want your popcorn so bad. haha. Anyways, we are dying to see this!! My daughter has a small obsession with the Cars movies- they are SO good! We loved the first Cars movie!! Can’t wait to see this one! We are hoping to see this film this weekend. Cars 1 was the first movie we took my son to see in the theater and McQueen has long been loved in our home, though my younger daughter swears it’s all about Mater! I’m glad to see that the friendships at the heart of the story are featured prominently here. Thanks for the review. Cars surely has turned into a great franchise for kids and families. Glad to see this third movie is just as good as the others. This movie is going to be awesome! I can’t wait to take our kids!